A Satisfactory rating requires a positive attitude toward students, as shown by availability outside of class, assistance with student professional development, and jobs/ graduate school placement. I really enjoy spending time with my students, facilitating their creative and professional development, and forging relationships that extend beyond graduation. Through my interactions with them, my goal is to help each person grow into a professional peer — to be come someone I would trust to be a valued collaborator, and solve problems with, up to and after graduation. Documentation of my positive attitude towards students is provided below in the form of course evaluations, student comments (particularly about availability), extra class time, and letters of recommendation. 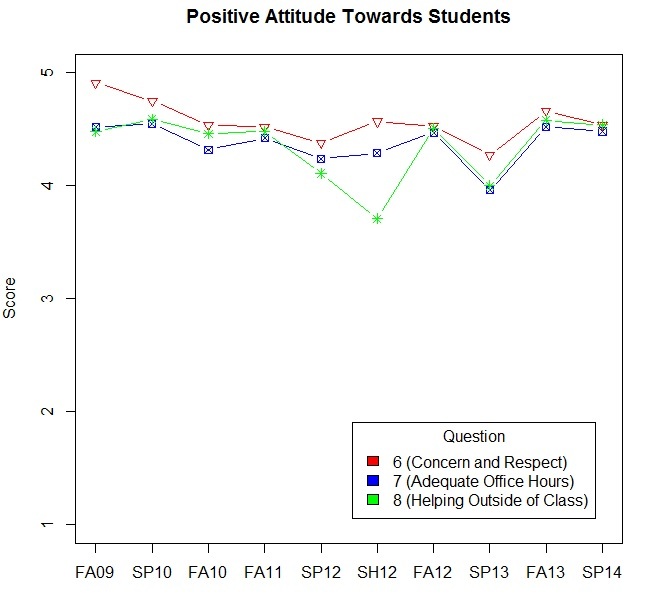 Course Evaluations – Course evaluations in the area of attitude towards students have consistently been very high (see Figure below). Course evaluation questions used to provide evidence include #6 (concern and respect towards students), #7 (maintaining adequate office hours), and #8 (effectively helping students outside of class). Lower scores are evident only during the semesters where major changes to course content or structure were undertaken, for example during the introduction of the honors course in spring 2012 (SH12) and during the introduction of an entirely new approach to course organization and grading in SP13. Extra Class Time – Since 2010, I have consistently spent 4-5 hours in open lab on Monday nights at hacking sessions, and since 2012 I have offered one or two open labs on Saturday and Sunday afternoons each month. In addition, written comments from student course evaluations overwhelmingly commend my availability by text message, even sometimes in the middle of the night.